Mometasone furoate is a white powder with an empirical formula of C 27 H 30 Cl 2 O 6 , and molecular weight 521.44 Daltons. The ASMANEX TWISTHALER 220 mcg product is a cap-activated inhalation-driven multi-dose dry powder inhaler containing mometasone furoate and anhydrous lactose (which contains milk proteins). Each actuation of the ASMANEX TWISTHALER 220 mcg inhaler provides a measured dose of 1.5 mg mometasone furoate inhalation powder, containing 220 mcg of mometasone furoate. This results in delivery of 200 mcg mometasone furoate from the mouthpiece, based on in vitro testing at flow rates of 30 L/min and 60 L/min with constant volume (2 L). The amount of mometasone furoate emitted from the inhaler in vitro did not differ significantly for flow rates ranging from 28.3 L/min to 70 L/min for fixed intervals of 2 seconds. However, the amount of drug delivered to the lung will depend on patient factors such as inspiratory flow and peak inspiratory flow through the device. In adult and adolescent patients with varied asthma severity, mean peak inspiratory flow rate through the device was 69 L/min (range 54-77 L/min). 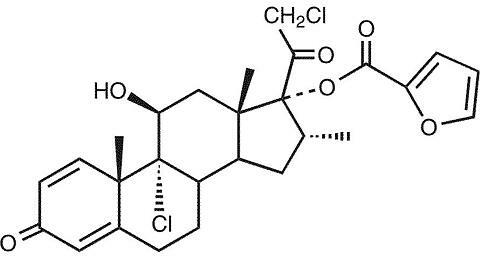 Mechanism of Action Mometasone furoate is a corticosteroid demonstrating potent anti-inflammatory activity. The precise mechanism of corticosteroid action on asthma is not known. Inflammation is an important component in the pathogenesis of asthma. Corticosteroids have been shown to have a wide range of inhibitory effects on multiple cell types (eg, mast cells, eosinophils, neutrophils, macrophages and lymphocytes) and mediators (eg, histamine, eicosanoids, leukotrienes, and cytokines) involved in inflammation and in the asthmatic response. These anti-inflammatory actions of corticosteroids may contribute to their efficacy in asthma. Mometasone furoate has been shown in vitro to exhibit a binding affinity for the human glucocorticoid receptor which is approximately 12 times that of dexamethasone, 7 times that of triamcinolone acetonide, 5 times that of budesonide, and 1.5 times that of fluticasone. The clinical significance of these findings is unknown. In a three-way cross over study in 15 asthmatic patients receiving 50 or 100 mcg of mometasone furoate inhalation powder to placebo twice daily for two weeks, mometasone furoate inhalation powder reduced airway reactivity to adenosine monophosphate. In another study, pretreatment with mometasone furoate inhalation powder for 5 days attenuated the early and late phase reactions following inhaled allergen challenge and also reduced allergen-induced hyperresponsiveness to methacholine. Mometasone furoate inhalation powder was also shown to attenuate the increase in inflammatory cells (total and activated eosinophils) in induced sputum following allergen and methacholine challenge. The clinical significance of these findings is unknown. Studies in asthmatic patients have demonstrated that ASMANEX TWISTHALER provides a favorable ratio of topical to systemic activity due to its primary local effect along with the extensive hepatic metabolism and the lack of active metabolites (see below). Though effective for the treatment of asthma, glucocorticoids do not affect asthma symptoms immediately. Maximum improvement in symptoms following inhaled administration of mometasone furoate may not be achieved for 1 to 2 weeks or longer after starting treatment. When glucocorticoids are discontinued, asthma stability may persist for several days or longer. Pharmacokinetics: Absorption: Following a 1000 mcg inhaled dose of tritiated mometasone furoate inhalation powder to 6 healthy human subjects, plasma concentrations of unchanged mometasone furoate were shown to be very low compared to the total radioactivity in plasma. Following an inhaled single 400 mcg dose of ASMANEX TWISTHALER treatment to 24 healthy subjects, plasma concentrations for most subjects were near or below the lower limit of quantitation for the assay (50 pcg/mL). The mean absolute systemic bioavailability of the above single inhaled 400 mcg dose, compared to an intravenous 400 mcg dose of mometasone furoate, was determined to be less than 1%. Following administration of the recommended highest inhaled dose (400 mcg twice daily) to 64 patients for 28 days, concentration-time profiles were discernible, but with large inter-subject variability. The coefficient of variation for C max and AUC ranged from approximately 50-100%. The mean peak plasma concentrations at steady state ranged from approximately 94 to 114 pcg/mL and the mean time to peak levels ranged from approximately 1.0 to 2.5 hours. Distribution: Based on the study employing a 1000 mcg inhaled dose of tritiated mometasone furoate inhalation powder in humans, no appreciable accumulation of mometasone furoate in the red blood cells was found. Following an intravenous 400 mcg dose of mometasone furoate, the plasma concentrations showed a biphasic decline, with a mean terminal half-life of about 5 hours and the mean steady-state volume of distribution of 152 liters. The in vitro protein binding for mometasone furoate was reported to be 98 to 99% (in a concentration range of 5 to 500 ng/mL). Metabolism: Studies have shown that mometasone furoate is primarily and extensively metabolized in the liver of all species investigated and undergoes extensive metabolism to multiple metabolites. In vitro studies have confirmed the primary role of CYP 3A4 in the metabolism of this compound, however, no major metabolites were identified. Excretion: Following an intravenous dosing, the terminal half-life was reported to be about 5 hours. Following the inhaled dose of tritiated 1000 mcg mometasone furoate, the radioactivity is excreted mainly in the feces (a mean of 74%), and to a small extent in the urine (a mean of 8%) up to 7 days. No radioactivity was associated with unchanged mometasone furoate in the urine. Special Populations: Administration of a single inhaled dose of 400 mcg mometasone furoate to subjects with mild (n=4), moderate (n=4), and severe (n=4) hepatic impairment resulted in only 1 or 2 subjects in each group having detectable peak plasma concentrations of mometasone furoate (ranging from 50 to 105 pcg/mL). The observed peak plasma concentrations appear to increase with severity of hepatic impairment, however, the numbers of detectable levels were few. The effects of renal impairment, age or gender on mometasone furoate pharmacokinetics have not been adequately investigated. Drug-Drug Interaction: An inhaled dose of mometasone furoate 400 mcg was given to 24 healthy subjects twice daily for 9 days and ketoconazole 200 mg (as well as placebo) were given twice daily concomitantly on Days 4 to 9. Mometasone furoate plasma concentrations were <150 pcg/mL on Day 3 prior to co-administration of ketoconazole or placebo. Following concomitant administration of ketoconazole, 4 (out of 12) subjects in the ketoconazole treatment group (n=12) had peak plasma concentrations of mometasone furoate >200 pcg/mL on Day 9 (211 to 324 pcg/mL). Since mometasone furoate plasma levels appear to increase and plasma cortisol levels appear to decrease upon concomitant administration of ketoconazole, caution should be exercised in the co-administration of these drugs. Pharmacodynamics: The potential effect of mometasone furoate on the hypothalamic-pituitary-adrenal axis was assessed in a 29-day study. A total of 64 adult patients with mild to moderate asthma were randomized to one of 4 treatment groups: ASMANEX TWISTHALER 440 mcg twice daily, ASMANEX TWISTHALER 880 mcg twice daily, oral prednisone 10 mg once daily, or placebo. The 30-minute post-Cosyntropin stimulation serum cortisol concentration on Day 29 was 23.2 mcg/dL for the ASMANEX 440 mcg twice daily group and 20.8 mcg/dL for the ASMANEX 880 mcg twice daily group, compared to 14.5 mcg/dL for the oral prednisone 10 mg group and 25 mcg/dL for the placebo group. The difference between ASMANEX 880 mcg twice daily (twice the maximum recommended dose) and placebo was statistically significant. Clinical Trials: The efficacy of ASMANEX TWISTHALER has been studied across a wide range of doses in double-blind placebo-controlled 12-week treatment clinical trials involving 1941 patients 12 years of age and older with asthma of varying severity. Patients Previously Maintained on Bronchodilators Alone ASMANEX TWISTHALER was studied in three 12-week double-blind trials in 737 patients with mild to moderate asthma (mean baseline FEV 1 [cong ]2.6 L, 72% of predicted normal) who were maintained on short-acting beta-2 agonists alone. The first two trials evaluated doses of 440 mcg administered as 2 inhalations once daily in the morning and one of these studies also evaluated 200 mcg twice daily. In both trials, AM pre-dose FEV 1 was significantly improved at Endpoint (last observation) following treatment with 440 mcg ASMANEX TWISTHALER once daily in the morning as compared to placebo (14% vs. 2.5%, respectively, in one trial and 16% vs. 5.5% in the other). There was also a significant improvement in AM pre-dose FEV 1 at Endpoint following treatment with ASMANEX TWISTHALER 220 mcg twice daily. Other measures of lung function (AM and PM PEFR) also showed improvement compared to placebo. Patients receiving ASMANEX TWISTHALER treatment had reduced frequency of beta-2 agonist rescue medication use compared to those on placebo (mean reductions at Endpoint 2.2 and 0.5 puffs per day, respectively, from a baseline of 4.1 puffs/day). Additionally, fewer patients receiving ASMANEX TWISTHALER 440 mcg once daily experienced asthma worsenings than did patients receiving placebo. In the third trial, 195 asthmatic patients were treated with ASMANEX TWISTHALER 220 mcg once daily in the evening or placebo. The AM FEV 1 at Endpoint was significantly improved compared to placebo (mean change at Endpoint 0.43 L or 16.8% vs. 0.16 L or 6%, respectively, see Figure 1). Evening PEF increased 24.96 L/min (7%) from baseline in the ASMANEX TWISTHALER group compared to 8.67 L/min (4%) in placebo. 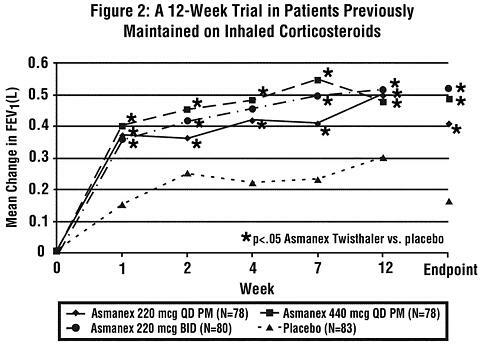 Patients Previously Maintained on Inhaled Corticosteroids The efficacy and safety of ASMANEX TWISTHALER in doses ranging from 110 mcg twice daily to 440 mcg twice daily was evaluated in three trials in 1072 patients previously maintained on inhaled corticosteroids. In the first two trials, asthmatic patients (mean baseline FEV 1 ~ 2.6 L, 76% predicted) were previously on either beclomethasone dipropionate [84-1200 mcg/day], flunisolide [100-2000 mcg/day], fluticasone propionate [110-880 mcg/day], or triamcinolone acetonide [300-2400 mcg/day]. The first trial included 307 patients who were treated in an open-label fashion with ASMANEX TWISTHALER 220 mcg (110 mcg x 2 inhalations) twice daily for 2 weeks followed by 12 weeks of double-blind treatment with ASMANEX TWISTHALER 440 mcg once daily in the morning or placebo. The second trial involved 365 patients who continued on their previous dose of inhaled corticosteroids during a 2-week screening period before being switched to ASMANEX TWISTHALER 440 mcg twice daily, 220 mcg twice daily, 110 mcg twice daily, beclomethasone dipropionate 168 mcg twice daily or placebo for 12 weeks. In the first trial, AM pre-dose FEV 1 was effectively maintained (-1.4% change from baseline to Endpoint) over the 12 weeks in the patients who were randomized to ASMANEX TWISTHALER 440 mcg once daily in the morning while decreasing 10% at Endpoint in those switched to placebo. In addition, fewer patients treated with ASMANEX TWISTHALER experienced worsenings of asthma compared to placebo. In the second trial, AM pre-dose FEV 1 was significantly increased at Endpoint when patients were switched to ASMANEX TWISTHALER 220 mcg twice daily (7% increase) or 440 mcg twice daily (6.2% increase) as compared to a decrease of 7% when switched to placebo. Additionally, beta-2 agonist rescue medication use was decreased for patients who received ASMANEX TWISTHALER treatment relative to those on placebo (mean reduction from baseline to Endpoint 1.1 puffs/day vs. increase of 0.7 puffs/day). Fewer patients receiving ASMANEX TWISTHALER treatment experienced asthma worsenings than did patients receiving placebo. The third trial evaluated the efficacy and safety of ASMANEX TWISTHALER compared to placebo in 400 asthmatic patients (mean FEV 1 67% predicted at baseline) previously maintained on beclomethasone dipropionate (HFA or CFC) 168-600 mcg/day, budesonide 200-1200 mcg/day, flunisolide 500-2000 mcg/day, fluticasone propionate 88-880 mcg/day or triamcinolone acetonide 400-1600 mcg/day. Following a 28-day inhaled corticosteroid dose-reduction phase, patients were randomized to ASMANEX TWISTHALER 440 mcg once daily in the evening (QD PM), 220 mcg QD PM, 220 mcg twice daily or placebo. At Endpoint, patients who received ASMANEX TWISTHALER 220 mcg QD PM, 440 mcg QD PM, or 220 mcg twice daily had a significant improvement in AM FEV 1 [0.41 L (19%), 0.49 L (22%), and 0.51 L (24%) in the 220 mcg QD PM, 440 mcg QD PM, and 220 mcg twice daily treatment group, respectively] compared to placebo [0.16 L (8%)]. (See Figure 2). Evening PEF increased 15.65 L/min (4.1%) with the 220 mcg QD PM dose, 39.26 L/min (10.7%) with the 440 mcg QD PM dose and 36.7 L/min (10.8%) with the 220 mcg twice daily dose respectively compared to a 1.4 L/min (1%) increase with placebo. Patients receiving all doses of ASMANEX TWISTHALER treatment had reduced frequency of beta agonist rescue medication use compared to those on placebo (mean reductions at Endpoint of 1.4 to 1.8 puffs/day from a baseline of more than 3 puffs/day compared to an increase in use by 0.5 puffs/day for placebo). In addition, fewer patients receiving ASMANEX TWISTHALER experienced asthma worsenings than did those on placebo. Patients Previously Maintained on Oral Corticosteroids The efficacy of ASMANEX TWISTHALER 440 mcg and 880 mcg twice daily was evaluated in one 12-week double-blind trial in patients previously maintained on oral corticosteroids. A total of 132 patients requiring oral prednisone (baseline mean daily oral prednisone requirement approximately 12 mg; baseline FEV 1 of 1.8 L, 59% of predicted normal), most of whom were also on inhaled corticosteroids (baseline inhaled steroid: beclomethasone dipropionate [168-840 mcg/day], budesonide [800-1600 mcg/day], flunisolide [1000-2000 mcg/day], fluticasone propionate [440-1760 mcg/day], or triamcinolone acetonide [400-2400 mcg/day]) were studied. Patients who received ASMANEX TWISTHALER 440 mcg twice daily had a significant reduction in their oral prednisone (46%) as compared to placebo (164% increase in oral prednisone dose). Additionally, 40% of patients on ASMANEX TWISTHALER 440 mcg twice daily were able to completely discontinue their use of prednisone, whereas 60% of patients on placebo had an increase in daily prednisone use. Patients on ASMANEX TWISTHALER had significant improvement in lung function (14% increase) compared to a 12% decrease in FEV 1 in the placebo group. Additionally, mean rescue beta-2 agonist use was reduced to approximately 3 puffs/day from a baseline of 4-5 puffs/day with ASMANEX TWISTHALER treatment, compared to an increase of 0.3 puffs/day on placebo. Patients who received ASMANEX TWISTHALER 880 mcg twice daily experienced no additional benefit beyond that seen with 440 mcg twice daily. ASMANEX TWISTHALER inhaler is indicated for the maintenance treatment of asthma as prophylactic therapy in patients 12 years of age and older. The ASMANEX TWISTHALER inhaler is also indicated for asthma patients who require oral corticosteroid therapy, where adding ASMANEX TWISTHALER therapy may reduce or eliminate the need for oral corticosteroids. ASMANEX TWISTHALER is NOT indicated for the relief of acute bronchospasm. Hypersensitivity to any of the ingredients of this preparation contraindicates its use (see DESCRIPTION ). Particular care is needed for patients who are transferred from systemically active corticosteroids to the ASMANEX TWISTHALER inhaler because deaths due to adrenal insufficiency have occurred in asthmatic patients during and after transfer from systemic corticosteroids to less systemically available inhaled corticosteroids. After withdrawal from systemic corticosteroids, a number of months are required for recovery of HPA function. Patients who have been previously maintained on 20 mg or more per day of prednisone (or its equivalent) may be most susceptible, particularly when their systemic corticosteroids have been almost completely withdrawn. During this period of HPA suppression, patients may exhibit signs and symptoms of adrenal insufficiency when exposed to trauma, surgery or infection (particularly gastroenteritis) or other conditions associated with severe electrolyte loss. Although the ASMANEX TWISTHALER inhaler may improve control of asthma symptoms during these episodes, in recommended doses it supplies less than normal physiological amounts of glucocorticoid systemically and does NOT provide the mineralocorticoid activity necessary for coping with these emergencies. Patients requiring oral corticosteroids should be weaned slowly from systemic corticosteroid use after transferring to ASMANEX TWISTHALER. Lung function (FEV 1 or PEF), beta agonist use, and asthma symptoms should be carefully monitored during withdrawal of oral corticosteroids. In addition to monitoring asthma signs and symptoms, patients should be observed for signs and symptoms of adrenal insufficiency such as fatigue, lassitude, weakness, nausea and vomiting, and hypotension. Transfer of patients from systemic corticosteroid therapy to the ASMANEX TWISTHALER inhaler may unmask allergic conditions previously suppressed by the systemic corticosteroid therapy, eg, rhinitis, conjunctivitis, and eczema. Persons who are on drugs which suppress the immune system are more susceptible to infections than healthy individuals. Chickenpox and measles, for example, can have a more serious or even fatal course in nonimmune children or adults on corticosteroids. In such children or adults who have not had these diseases or who are not properly immunized, particular care should be taken to avoid exposure. How the dose, route, and duration of corticosteroid administration affect the risk of developing a disseminated infection is not known. The contribution of the underlying disease and/or prior corticosteroid treatment to the risk is also not known. If exposed to chickenpox, prophylaxis with varicella zoster immune globulin (VZIG) may be indicated. If exposed to measles, prophylaxis with pooled intramuscular immunoglobulin (IG) may be indicated. (See the respective package inserts for complete VZIG and IG prescribing information.) If chickenpox develops, treatment with antiviral agents may be considered. The ASMANEX TWISTHALER inhaler is not a bronchodilator and is not indicated for rapid relief of bronchospasm or other acute episodes of asthma. As with other inhaled asthma medications, bronchospasm may occur with an immediate increase in wheezing after dosing. If bronchospasm occurs following dosing with the ASMANEX TWISTHALER inhaler, it should be treated immediately with a fast-acting inhaled bronchodilator. Treatment with the ASMANEX TWISTHALER inhaler should be discontinued and alternative therapy instituted. Patients should be instructed to contact their physician immediately when episodes of asthma that are not responsive to bronchodilators occur during the course of treat-ment with the ASMANEX TWISTHALER inhaler. During such episodes, patients may require therapy with oral corticosteroids. General: During withdrawal from oral corticosteroids, some patients may experience symptoms of systemically active corticosteroid withdrawal, eg, joint and/or muscular pain, lassitude, and depression, despite maintenance or even improvement of respiratory function. The ASMANEX TWISTHALER inhaler will often improve control of asthma symptoms with less suppression of HPA function than therapeutically equivalent oral doses of prednisone. Since mometasone furoate is absorbed into the circulation and can be systemically active at higher doses, the full beneficial effects of the ASMANEX TWISTHALER inhaler in minimizing HPA dysfunction may be expected only when recommended dosages are not exceeded and individual patients are titrated to the lowest effective dose. Since individual sensitivity to effects on cortisol production exists, physicians should consider this information when prescribing the ASMANEX TWISTHALER inhaler. Because of the possibility of systemic absorption of inhaled corticosteroids, patients treated with these drugs should be observed carefully for any evidence of systemic corticosteroid effects. Particular care should be taken in observing patients postoperatively or during periods of stress for evidence of inadequate adrenal response. It is possible that systemic corticosteroid effects such as hypercorticism, reduced bone mineral density and adrenal suppression may appear in a small number of patients, particularly at higher doses. If such changes occur, the ASMANEX TWISTHALER inhaler dose should be reduced slowly, consistent with accepted procedures for management of asthma symptoms and for tapering of systemic steroids. Decreases in bone mineral density (BMD) have been observed with long-term administration of products containing inhaled glucocorticoids, including mometasone furoate. The clinical significance of small changes in bone mineral density with regard to long-term outcomes is unknown. In a two-year double-blind study in 103 male and female asthma patients 18 to 50 years of age previously maintained on bronchodilator therapy (Baseline FEV 1 85-88% predicted), treatment with ASMANEX TWISTHALER 220 mcg twice daily resulted in significant reductions in lumbar spine (LS) BMD at the end of the treatment period compared to placebo. The mean change from Baseline to Endpoint in the lumbar spine BMD was -0.015 (-1.43%) for the ASMANEX TWISTHALER group compared to 0.002 (0.25%) for the placebo group. In another two-year double-blind study in 87 male and female asthma patients 18 to 50 years of age previously maintained on bronchodilator therapy (Baseline FEV 1 82-83% predicted), treatment with ASMANEX TWISTHALER 440 mcg twice daily demonstrated no statistically significant changes in lumbar spine BMD at the end of the treatment period compared to placebo. The mean change from Baseline to Endpoint in the lumbar spine BMD was -0.018 (-1.57%) for the ASMANEX TWISTHALER group compared to -0.006 (-0.43%) for the placebo group. Patients with major risk factors for decreased bone mineral content, such as prolonged immobilization, family history of osteoporosis, or chronic use of drugs that can reduce bone mass (eg, anticonvulsants and corticosteroids) should be monitored and treated with established standards of care. Although patients in clinical trials have received the ASMANEX TWISTHALER inhaler on a continuous basis for periods of up to 2 years, the long-term local and systemic effects of ASMANEX TWISTHALER in human subjects are not completely known. In particular, the effects resulting from chronic use of the ASMANEX TWISTHALER inhaler on developmental or immunological processes in the mouth, pharynx, trachea, and lung are unknown. In clinical trials with the ASMANEX TWISTHALER inhaler, localized infections with Candida albicans occurred in the mouth and pharynx in some patients. If oropharyngeal candidiasis develops, it should be treated with appropriate local or systemic (ie, oral) anti-fungal therapy while still continuing with ASMANEX TWISTHALER therapy, but at times therapy with the ASMANEX TWISTHALER inhaler may need to be temporarily interrupted under close medical supervision. Inhaled corticosteroids should be used with caution, if at all, in patients with active or quiescent tuberculosis infection of the respiratory tract, untreated systemic fungal, bacterial, viral, or parasitic infections; or ocular herpes simplex. Information for Patients: Patients being treated with the ASMANEX TWISTHALER inhaler should be given the following information. This information is intended to aid in the safe and effective use of the ASMANEX TWISTHALER inhaler. It is not a disclosure of all intended or possible adverse effects. Patients should be advised that ASMANEX TWISTHALER is not a bronchodilator and should not be used to relieve acute asthma symptoms. Acute asthma symptoms should be treated with an inhaled, short-acting beta-2 agonist such as albuterol. Patients should be advised to use the ASMANEX TWISTHALER inhaler at regular intervals since its effectiveness depends on regular use. Maximum benefit may not be achieved for 1 to 2 weeks or longer after starting treatment. If symptoms do not improve in that time frame or if the condition worsens, the patient should be instructed to contact the physician. Patients should be warned to avoid exposure to chickenpox or measles, and if they are exposed, to consult their physicians without delay. Patients who are at an increased risk for decreased BMD should be advised that the use of corticosteroids may pose an additional risk and should be monitored and, where appropriate, be treated for this condition. Patients should be advised that long-term use of inhaled corticosteroids, including ASMANEX TWISTHALER may increase the risk of some eye problems (cataracts or glaucoma). For the proper use of the ASMANEX TWISTHALER inhaler, and to attain maximum improvement, the patient should read and follow the accompanying Patient's Instructions for Use. Patients should be instructed to record the date of pouch opening on the cap label, and discard the inhaler 45 days after opening the foil pouch or when the dose counter reads "00," whichever comes first. The inhaler should be held upright while removing the cap. The medication should be taken as directed, breathing rapidly and deeply, and patients should not breathe out through the inhaler. The mouthpiece should be wiped dry and the cap replaced immediately following each inhalation, rotated fully until the click is heard. Rinsing of mouth after inhalation is advised. Patients should store the unit as instructed. The digital dose counter displays the doses remaining. When the counter indicates zero, the cap will lock and the unit must be discarded. Patients should be advised that if the dose counter is not working correctly, the unit should not be used and it should be brought to their physician or pharmacist. Drug Interactions: In clinical studies, the concurrent administration of the ASMANEX TWISTHALER inhaler and other drugs commonly used in the treatment of asthma was not associated with any unusual adverse events. However, ketoconazole, a potent inhibitor of cytochrome P450 3A4, may increase plasma levels of mometasone furoate during concomitant dosing. Carcinogenesis, Mutagenesis, Impairment of Fertility: In a 2-year carcinogenicity study in Sprague Dawley rats, mometasone furoate demonstrated no statistically significant increase in the incidence of tumors at inhalation doses up to 67 mcg/kg (approximately 8 times the maximum recommended daily inhalation dose in adults on an AUC basis). In a 19-month carcinogenicity study in Swiss CD-1 mice, mometasone furoate demonstrated no statistically significant increase in the incidence of tumors at inhalation doses up to 160 mcg/kg (approximately 10 times the maximum recommended daily inhalation dose in adults on an AUC basis). Pregnancy: Teratogenic Effects: Pregnancy Category C: When administered to pregnant mice, rats, and rabbits, mometasone furoate increased fetal malformations. The doses that produced malformations also decreased fetal growth, as measured by lower fetal weights and/or delayed ossification. Mometasone furoate also caused dystocia and related complications when administered to rats during the end of pregnancy. In mice, mometasone furoate caused cleft palate at subcutaneous doses of 60 mcg/kg and above (less than the maximum recommended daily inhalation dose in adults on a mcg/m 2 basis). Fetal survival was reduced at 180 mcg/kg (approximately equal to the maximum recommended daily inhalation dose in adults on a mcg/m 2 basis). No toxicity was observed at 20 mcg/kg (less than the maximum recommended daily inhalation dose in adults on a mcg/m 2 basis). In rats, mometasone furoate produced umbilical hernia at topical dermal doses of 600 mcg/kg and above (approximately 6 times the maximum recommended daily inhalation dose in adults on a mcg/m 2 basis). A dose of 300 mcg/kg (approximately 3 times the maximum recommended daily inhalation dose in adults on a mcg/m 2 basis) produced delays in ossification, but no malformations. In rabbits, mometasone furoate caused multiple malformations (eg, flexed front paws, gallbladder agenesis, umbilical hernia, hydrocephaly) at topical dermal doses of 150 mcg/kg and above (approximately 3 times the maximum recommended daily inhalation dose in adults on a mcg/m 2 basis). In an oral study, mometasone furoate increased resorptions and caused cleft palate and/or head malformations (hydrocephaly and domed head) at 700 mcg/kg (less than the maximum recommended daily inhalation dose in adults on an AUC basis). At 2800 mcg/kg (approximately 2 times the maximum recommended daily inhalation dose in adults on an AUC basis) most litters were aborted or resorbed. No toxicity was observed at 140 mcg/kg (less than the maximum recommended daily inhalation dose in adults on an AUC basis). There are no adequate and well-controlled studies in pregnant women. The ASMANEX TWISTHALER, like other corticosteroids, should be used during pregnancy only if the potential benefits justify the potential risks to the fetus. Experience with oral corticosteroids since their introduction in pharmacologic, as opposed to physiologic, doses suggests that rodents are more prone to teratogenic effects from corticosteroids than humans. In addition, because there is a natural increase in corticosteroid production during pregnancy, most women will require a lower exogenous corticosteroid dose and many will not need corticosteroid treatment during pregnancy. Nonteratogenic Effects: Hypoadrenalism may occur in infants born to women receiving corticosteroids during pregnancy. Such infants should be carefully monitored. Nursing Mothers: It is not known if mometasone furoate is excreted in human milk. Because other corticosteroids are excreted in human milk, caution should be used when ASMANEX TWISTHALER is administered to nursing women. Pediatric Use: The safety and effectiveness of ASMANEX TWISTHALER treatment have been established in the age group 12 to 16 years. Clinical trials in adults and adolescents included 146 patients in this age group who received ASMANEX TWISTHALER treatment. No age-related differential responses to therapy were apparent. Safety and effectiveness in pediatric patients below the age of 12 years have not been established. Controlled clinical studies have shown that inhaled corticosteroids may cause a reduction in growth in pediatric patients. In these studies, the mean reduction in growth velocity was approximately one cm per year (range 0.3 to 1.8 per year) and appears to depend upon dose and duration of exposure. This effect was observed in the absence of laboratory evidence of hypothalamic-pituitary-adrenal (HPA) axis suppression, suggesting that growth velocity is a more sensitive indicator of systemic corticosteroid exposure in pediatric patients than some commonly used tests of HPA axis function. The long-term effects of this reduction in growth velocity associated with orally inhaled corticosteroids, including the impact on final adult height, are unknown. The potential for "catch up" growth following discontinuation of treatment with orally inhaled corticosteroids has not been adequately studied. The growth of children and adolescents (12 years of age and older) receiving orally inhaled corticosteroids, including ASMANEX TWISTHALER, should be monitored routinely (eg, via stadiometry). The potential growth effects of prolonged treatment should be weighed against clinical benefits obtained and the risks associated with alternative therapies. To minimize the systemic effects of orally inhaled corticosteroids, including ASMANEX TWISTHALER, each patient should be titrated to his/her lowest effective dose. Geriatric Use: A total of 175 patients 65 years of age and over (23 of whom were 75 years of age and over) have been treated with ASMANEX TWISTHALER in controlled clinical trials. No overall differences in safety or effectiveness were observed between these and younger patients, and other reported clinical experience has not identified differences in responses between the elderly and younger patients, but greater sensitivity of some older individuals cannot be ruled out. The following incidence of common adverse experiences is based on double-blind data from ten placebo-controlled clinical trials involving a total of 2809 patients previously maintained on inhaled steroids and/or bronchodilators (1140 males, 1669 females, age 12-83 years), who were treated for up to 12 weeks with the ASMANEX TWISTHALER product, an active comparator, or placebo. Adverse events were generally mild to moderate in severity. a Percentages are based on the number of female patients. The table above includes all events (whether considered drug-related or nondrug-related by the investigators) that occurred at a rate of >/=3% in any one mometasone furoate group and were more common than in the placebo group. In considering these data, the increased average duration of exposure for ASMANEX TWISTHALER patients should be taken into account. 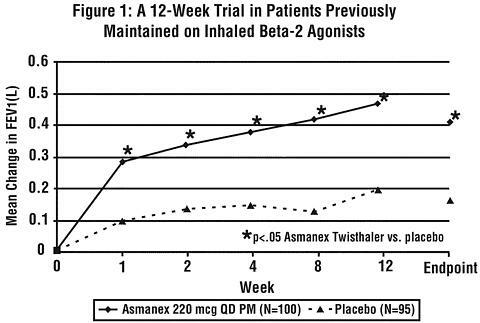 In a 12-week trial in adult asthmatics who previously required oral corticosteroids, the effects of ASMANEX TWISTHALER therapy administered as two 220 mcg inhalations twice daily (N=46) were compared with those of placebo (N=43). Adverse events, whether considered drug related or not by the investigators, reported in more than 3 patients in the ASMANEX TWISTHALER treatment group, and which occurred more frequently than on placebo were (ASMANEX TWISTHALER % vs. placebo %): musculoskeletal pain (22% vs. 14%), oral candidiasis (22% vs. 9%), sinusitis (22% vs. 19%), allergic rhinitis (20% vs. 5%), upper respiratory infection (15% vs. 14%), arthralgia (13% vs. 7%), fatigue (13% vs. 2%), depression (11% vs. 0%), and sinus congestion (9% vs. 0%). In considering these data, an increased duration of exposure for patients on ASMANEX TWISTHALER treatment (77 days vs. 58 days on placebo) should be taken into account. Cases of growth suppression and decreased bone mineral density have been reported for orally inhaled corticosteroids, including mometasone furoate inhalation powder. The potential for acute toxic effects following overdose with the ASMANEX TWISTHALER inhaler is low. Because of low systemic bioavailability and an absence of acute drug-related systemic findings in clinical studies, overdose is unlikely to require any treatment other than observation. If used at excessive doses for prolonged periods, systemic effects such as hypercorticism may occur. Single daily doses as high as 1200 mcg per day for 28 days were well-tolerated and did not cause a significant reduction in plasma cortisol AUC (94% of placebo AUC). Single oral doses up to 8000 mcg have been studied on human volunteers with no adverse events reported. The ASMANEX TWISTHALER product should be administered by the orally inhaled route in patients 12 years of age and older. Individual patients will experience a variable time to onset and degree of symptom relief. Maximum benefit may not be achieved for 1 to 2 weeks or longer. The safety and efficacy of ASMANEX TWISTHALER when administered in excess of recommended doses have not been established. The recommended starting doses and highest recommended daily dose for ASMANEX TWISTHALER treatment based on prior asthma therapy are provided in the table below. * When administered once daily ASMANEX TWISTHALER should only be taken in the PM. ** The 440 mcg daily dose may be administered in divided doses of 220 mcg twice daily or as 440 mcg once daily. NOTE: In all patients, it is desirable to titrate to the lowest effective dose once asthma stability is achieved. **/* For Patients Currently Receiving Chronic Oral Corticosteroid Therapy: Prednisone should be reduced no faster than 2.5 mg/day on a weekly basis, beginning after at least 1 week of ASMANEX TWISTHALER therapy. Patients should be carefully monitored for signs of asthma instability, including serial objective measures of airflow, and for signs of adrenal insufficiency (see WARNINGS ). Once prednisone reduction is complete, the dosage of mometasone furoate should be reduced to the lowest effective dosage. Patients should be instructed to inhale rapidly and deeply (see enclosed patient instructions). Rinsing the mouth after inhalation is advised. The ASMANEX TWISTHALER product is comprised of an assembled plastic cap-activated dosing mechanism with dose counter, drug-product storage unit, drug-product formulation (240 mg), and mouthpiece, covered by a white screw cap which bears the product label. The body of the inhaler is white and the turning grip is pink with a clear plastic window indicating the number of doses remaining. The inhaler will not deliver subsequent doses once the counter reaches zero ("00"). ASMANEX TWISTHALER 220 mcg, which delivers 200 mcg mometasone furoate from the mouthpiece: 14 inhalation units (Institutional Use Only; NDC # 0085-1341-04); 30 inhalation units (NDC # 0085-1341-03); 60 inhalation units (For more than one inhalation daily; NDC # 0085-1341-02); or 120 inhalation units (For more than 2 inhalations daily; NDC # 0085-1341-01). Discard the inhaler 45 days after opening the foil pouch or when dose counter reads "00," whichever comes first.